Welcome to the cartography of Caeora, the mastermind behind Blue Sword Games. Caeora produces stunning maps and RPG tokens for tabletop roleplaying games, available to their patreon supporters plus some great freebies from time to time. 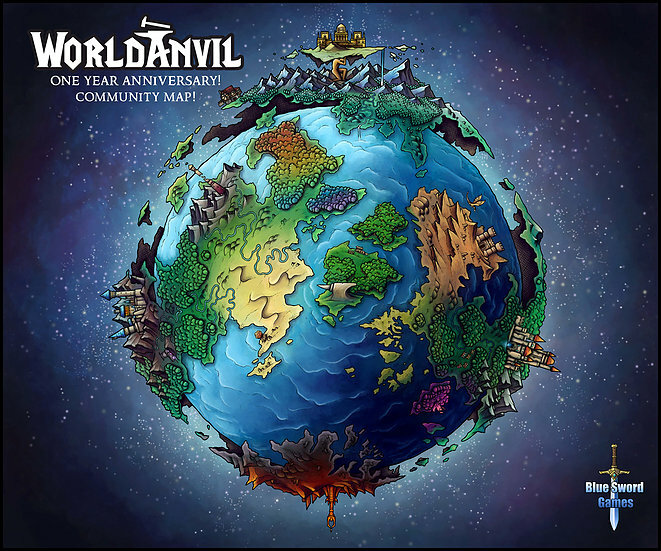 They recently completed the WorldAnvil Map for our first anniversary, and we caught up with Caeora to talk mapmaking. When did you start mapmaking and why? Some of my first maps were made when I was quite young really, I can’t remember the exact age anymore, perhaps around 7-9. This was about the same time I started reading fantasy books like the Belgariad series by David Eddings and of course, the Lord of the Rings by J. R. R Tolkien. It didn’t take me long to imagine my own fantasy worlds in my head and occasionally I would try to write them down and draw maps for them. These maps were very simple and based on what I was most interested in at the time but I was always fascinated by the scope, scale and life a map could bring to a story and wanted that for my own little settings. What is your favourite map you’ve made, and what stands out about it to you? My favorite map to date, is the region of Ederfast. I spend a long time thinking and trying different approaches to making maps work, from battlemaps to world maps and this process takes a long time. Experimenting and trying to improve map features led me to the Ederfast map where everything clicked. It’s a map I now look back on with a certain degree of pride, and it’s a great example of my current world map/region map style. The way I draw mountains, forests and rivers, even coastlines (Although I’m still working on those) can all be seen in full display in the map. And that was just the line art, I also really love the subtle gradient of colours across the entire region from a red/orange colour at the top to a deep dark green at the bottom. How do you like to mix mapmaking and worldbuilding, and does the map come first or the world? I believe maps are simply an integral part of the worldbuilding process, you can do one without the other, but the ability to create something spectacular is lost. Maps offer scope, scale and sense of grounded realism that can center a world and story, while worldbuilding can offer detail, personality and character that makes a map truely unique. I personally like to mix them together as quickly as possible whenever I start working on a new map or when I try to write. What is your top tip for people new to cartography? Is there anything you wish you’d known when you began? There is nothing I wish I had know when I started, that’s not something I really worry about. It’s all a learning process, mapmaking is a skill that I’ve practiced over and over and the mistakes and lack of understanding have allowed me to improve to the point im at today. I’m sure In a few years I’ll look back on the maps I made and laugh at how I did something. My top tip for starting cartography is to simply draw maps, over and over. Start with small maps, not the maps of the world you really want to make, but a smaller map for a region or area of your world. You can always go back and redo smaller maps easily, but if you spend a month making a huge world map straight away you will find it far more difficult to re do it once you have learned a new technique for drawing mountains. If you’d like to learn more about Caeora’s patreon, check out his latest freebie – a free token for the Persian inspired Buraq, complete with stat block, or the Sea Dragon (pictured right). You can support Caeora’s work on Patreon, visit his website or follow him on twitter. Worldbuilders might find Caeora’s free compasses for WorldAnvil maps useful.